It's time for a very exciting post today, something I have been so so excited to share with you all, readers old and new! As you may or may not remember back in October I was lucky enough to be able to work with the fabulous ladies at Wonderland Wigs! 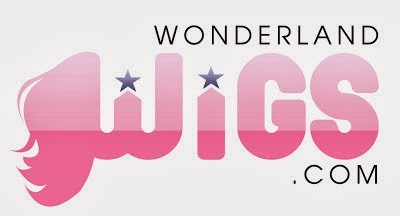 Wonderland Wigs is a heaven of hair extensions, hair pieces and wigs and as soon as I had checked out their website I was itching to try out a new look! I managed to get my hands on one of the Layered Flicked 3/4 Wig Half Wig Hairpiece's and even though I was apprehensive at first (the word "wig" being why), once I had tried it on that all melted away and I was obsessed! Here is my original post - Fabulous Hair In Seconds With Wonderland Wigs. My hair went from thin shoulder length average looking hair to gorgeous long, thick and fabulous in a matter of seconds - it is a god send! Not only do I and so many other bloggers love this brand but even celebrities having been seen rocking new do's from Wonderland Wigs - amazing! All you have to do is fill in the Rafflecopter below. Good Luck everyone! I cannot wait to see the winner rocking some new fab locks! http://www.wonderlandwigs.com/en/dip-dye-wigs/649-dark-blonde-black-ombre-wig.html totally love that defiantly my favorite but they have so many nice ones ! Would love to win the dark brown hair extensions clip in straight 8pcs. My celebrity hair love is Dita Von Teese, everything about her is just perfection! love this Black Clip In Fishtail Plait - it would be great to wear everyday! I think I'd like to win the same one you're wearing, but I only have short hair so would have to see what was best. I love Kimberly Walsh's hair best, she looks amazing. aahh these look fab! would love to own one! you look stunning girl! 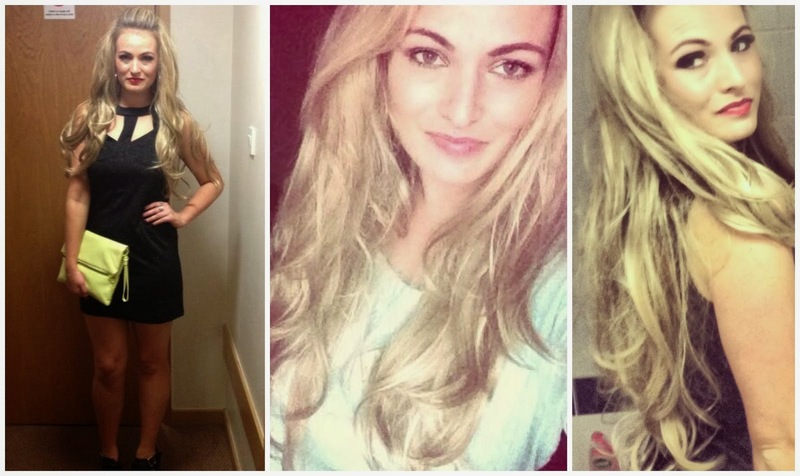 No special occasion is complete without my beloved extensions, but my current ones are starting to get a bit ratty so would love to win this comp! I'd probably get the 3/4 wavy double volume wig but I'd have to be colour matched! I really like http://www.wonderlandwigs.com/en/ladies-wigs/389-long-dark-brown-wavy-3-4-wig-half-wig-hairpiece.html and I adore Cheryl Coles hair. I would love win the Real Human Hair Extensions - Deluxe Volume Remy Set in coper red and I love the angelina jolie hair! Thats a tough decision, I'd either go for a fun wig like one of the dip dye bobs or something for my hair kit (I'm a makeup artist / hair stylist) like a braided bun. I'd love to win either the Heat resistant layered flicked wig - Breeze or Long heat resistant layered flicked wig - Verity - not sure yet. Hard decision. Great giveaway and the actress I'd pick would be Scarlett Johansson. I think lauren conrad has amazing hair! I love it! I heard good things about this Tangle Teezer and i hope i win! I've always wanted to try dip dyeing my hair but was never really sure what color to go with or if I should commit to getting dip dyed in the first place. I think the wig would definitely help me better decide! Plus, I love the combination of dark and light pink. It's too cute! My hair envy is Nicole Sherzinger, love her long dark hair. I love half wigs!! Would love another one! Whoops, didn't see the questions! I love Kelly Clarkson's hair from back in the day. I need the hair piece to get the length she has! I love the Giselle Brown and Blonde Dip-dye ombre wig :) i love cheryl coles hair!! I honestly wouldn't know which one to get! I already have two wonderlandwigs (the rita and the Ali) and they are great but I feel like it might be time for me to try out a Ginger 3/4th wig... I simply adore the ombre blonde to pink extensions like Demi Lovato used to have! Too bad I'm not a blonde! Would love to win blue/brown hair extensions ... I love hair J.Alba! I really want to win and my favourite is the Long dark blonde wig and my favourite person is mary kate and ashley olsen its the same colour as mine! Cheryl Cole has gorgeoussss hair. Love it. I have been wanting to try blond hair for a while but I still haven't worked up the courage to take the plunge and dye my hair so this http://www.wonderlandwigs.com/en/ladies-wigs/372-ronnie-2-tone-blonde-blend-curly-ladies-wig.html wig would be a great way for me to experiment with the colour and have a bit of fun at the same time. I just love Jennifer Aniston's hair it is always perfect. I'd love the Cat - Golden Blonde and Dark Red Ombre Wig! I love it. I love Cristina Aguilera's hair. And I think Nicole Scherzinger's hair is beautiful! Emma stone has lovely natural hair colour. I love Jessica Alba hair. Really love Kate Beckinsale hair style!!! Your hair looks so amazing! I'd love to win the http://www.wonderlandwigs.com/en/3-4-half-wigs/626-dip-dye-ombre-half-wig.html as I've always wanted to try the ombré look! I think Kelly Brook has pretty amazing hair! I love this one: http://www.wonderlandwigs.com/en/ladies-wigs/338-sandy-curly-side-parted-deep-red-wig.html. I would love to have the Breeze wig in Bohemian -- http://www.wonderlandwigs.com/en/heat-resistant-wigs/677-heat-resistant-wig-breeze.html I have always loved Jennifer Aniston's hair. Love the Dip Dye Ombre Half Wig Instant Weave Booster! I don't know the actress' name but she plays Charlie on Revolution. Gorgeous hair. Would love to win http://www.wonderlandwigs.com/en/hair-extensions/420-remy-clip-in-human-hair-extensions-deluxe-volume-set.html. I'm really loving the Tina - Long curly blonde wig. I love Jennifer Aniston's hair. It always looks so shiny and healthy! Sometimes I feel like having long hair so this would be wonderful as I have short hair! There are so many I would love to have but I think I have settled on the Zahiya - Extra/very long black curly ladies wig. I think that Sophia Loren has lovely hair. I think Shakira has the best hair. http://www.wonderlandwigs.com/en/ladies-wigs/229-porzia-short-black-spiky-layered-flicked-ladies-wig.html this rocks. Emma Watson's short hair is the coolest! I really loved the Miss Twirls~Dark red and blonde wig!!! Its so beautiful, i think id really have fun with it!!! Cheryl cole big hair is so cool!!!! I would want my hair to be like that! I would like the dark brown extension clip in dark brown. I think Pamela Anderson has beautiful hair. Actress Amy Jackson has the best hair. I would love to win some hair extensions to add a little length to my hair and volume as I have fine hair. I love Kate Middletons hair and Cheryl Cole. And celebrity's best hair is Dita von Teese! Ohhh Kirstie I have never enter a give-away before so you have stolen my giveaway virginity haha! 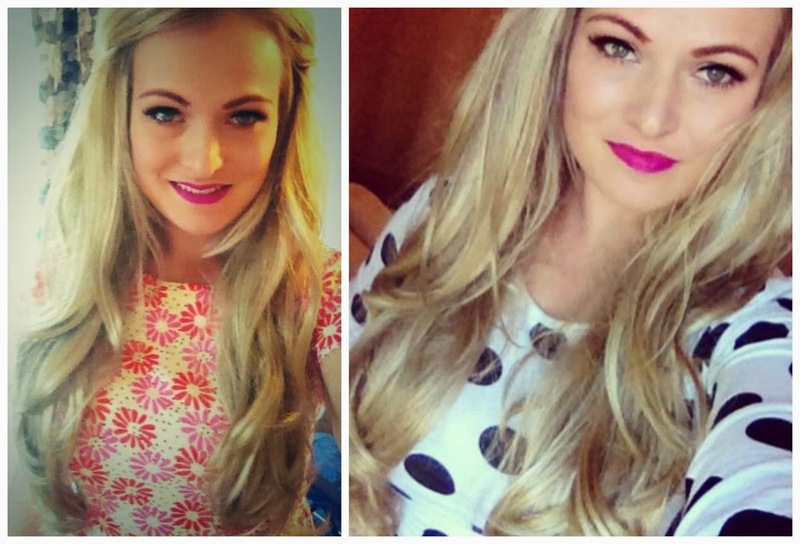 I am such a hair extension addict - anything to give me Taylor Swift like hair!